I was busy reading a thread on the UKQU Facebook Page about BOM’s and Mystery Quits for 2019. Lots of interesting suggestions and links to all of us Designery-types (including me putting my pennyworth in!). I’ve had an idea, I think it will work large scale, we’ll find out shall we?!! 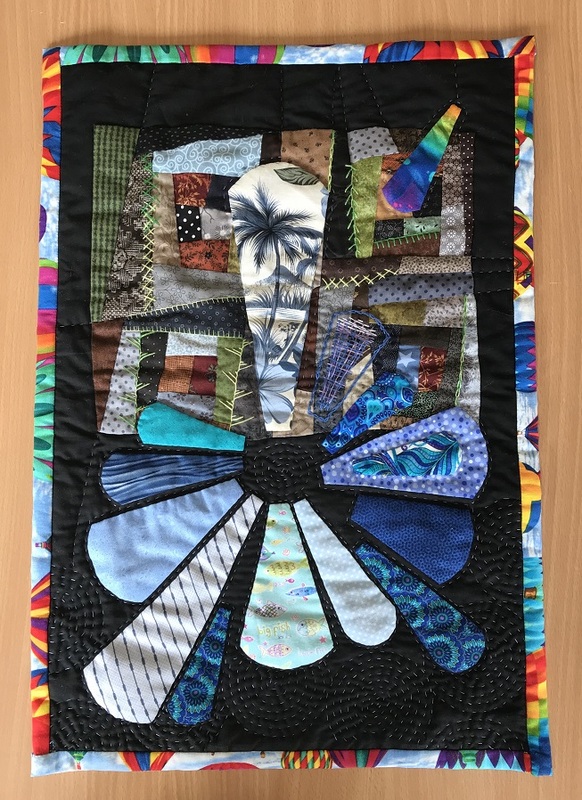 Let me put you in the picture first as it would be rude of me not to acknowledge where my idea is based from…..
Biddicks Quilters in St Austell, a group I’m associated with, sets a few challenges throughout the year, I generally take part if I can. What I intend running here for UKQU members is based on one such challenge, its been changed a bit and added to so it should cover more peoples tastes and abilities…..
‘ABBIE SUGGESTS’….. its another of my ‘Scrap & Stash’ projects…. If you contact me either here on the UKQU website, via messages or on my Facebook Page via messages (maybe Like my page while you’re there?) AbbieAnne Patchwork Quilting & Textiles, I’ll send you a list of criteria for you to make a patchwork block…… you’ll get…..
*****or Traditional 9 patch….. I’ll name you a block to make and 2 colours to include. I have a big book with very many traditional blocks in, I’ll randomly pick one, but I’m sorry, you’ll have to,make your own templates and I won’t be able to supply technique instruction as I won’t have sufficient time. I’m sure a little research will find you the how to if needed. 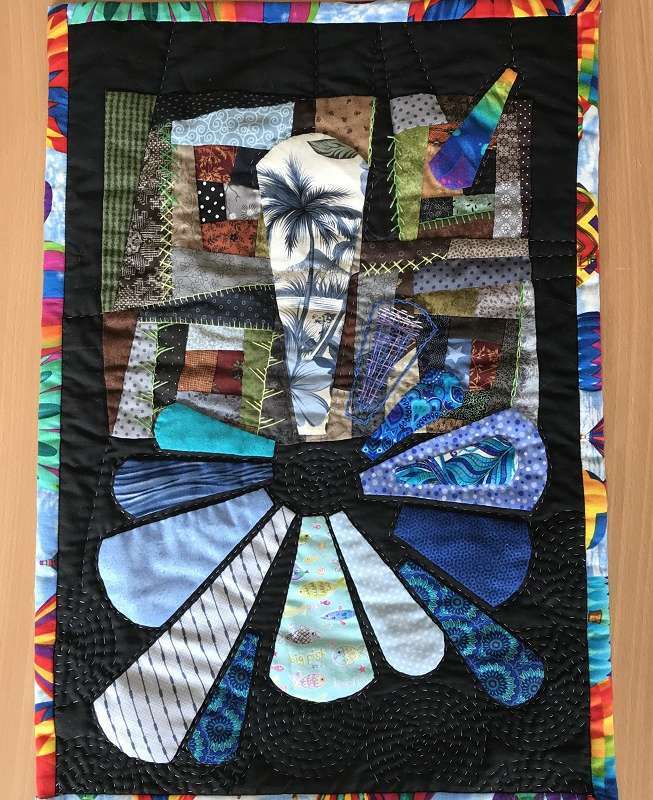 Here’s my original challenge, my lucky dip criteria: Blue, 15, Dresden petals…… remember, I’m a weirdo who does strange stuff just because…… so yes, scraps, there is also embroidery included, shapes stacked up, a bit of log cabin, hand piecing, applique & quilting……. I’ll make designers of you all yet, just wait and see!!….. here’s to a happy 2019, “There are no rights or wrongs, just happy outcomes and lessons learned”….. I look forward to hearing from you all…..
***** please remember I’m teaching a lot of the time, so I will respond to your requests as quickly as I can, during particularly busy periods I will respond at least once a week. 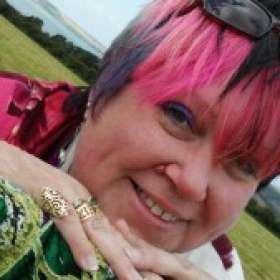 AbbieAnne Searle……this is me, Textile Artist, P&Q Nut, Teacher, Speaker, Author (and obviously very shy of course!) Here we go!! Mystery & BOM’s away!!! Mystery Two!!! …….Rubies & Cream BOM! Cats and threads and ribbons……. a few words of warning….. This sounds like fun, and I need something to get my mojo back. Please could I try both to start with and then make a decision about which to continue? if you would like photos or more explanation, would you please message me directly and I’ll send them to you. Hi Amy, welcome to playtime!….,,a lucky dip or a traditional sampler type block?